The Alberton Railway Station building is a fine example of an Edwardian railway station in PEI. It is located in the Town of Alberton near the former railway tracks which is now part of the Confederation Trail. The station has been incorporated as a tourist information centre into a green space known as Stone Station Park. It has adjacent picnic areas and shade trees. The registration includes the footprint of the building. 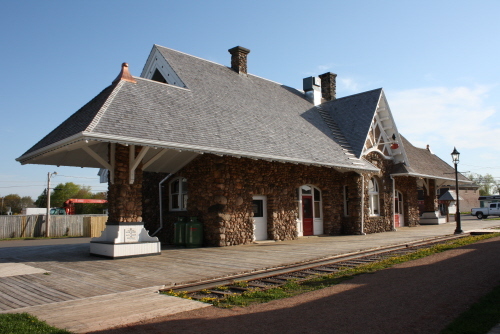 The Alberton Railway Station is significant as one of only 2 "boulder stations" constructed in PEI. The other is at Kensington, PEI. It was built of granite stone in 1904-1905 according to the design of the architect, Charles B. Chappell (1857-1931). He was born in Charlottetown and became noted for his work in other areas of the Maritimes. In PEI, he designed the Charlottetown City Hall (1887) and former Prince of Wales College Building (1898) which has since been destroyed. The Alberton Station served a vital economic role in Alberton until it closed in 1971.